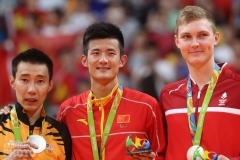 Two top seeds at the Yonex Sunrise Asia Youth U19 Badminton Championships stayed on the winning track when they advanced into the finals at Stadium Juara, Kuala Lumpur on Saturday. 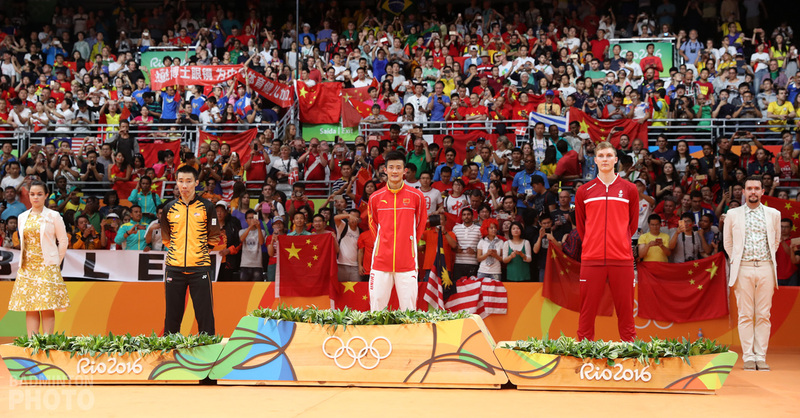 Men’s singles top seed, Iskandar Zulkarnain Zainuddin and men’s doubles top seed, Yew Heng Kheng/Ow Yao Han delighted the home crowd with contrasting wins while China has bounced back from disappointment in the team event and looks set to wrap up the other three golds. Boys’ singles top seed Zainuddin Iskandar Zulkarnain had an easy match, winning 21-7 21-12 over Misbun Sidek’s son, Misbun Ramdan. Iskandar said that he will give his best in the final against China’s Tian Houwei, whom he already beat in the team final on Wednesday. “I think tomorrow’s match against China will be 50-50,” added Iskandar. Malaysia was unable to make it an all-Malaysian final due to the loss of 10th seed, Mohd Ismail Muhammad Syawal (pictured top) to Tian, 13-21, 21-23. Malaysia’s singles coach Sun Chenghua said that Tian Houwei played better especially at the net and took advantage of Syawal’s mistakes. In the boys’ doubles, Yew Heng Kheng / Ow Yao Han were stretched to 3 games by Koreans Kang Ji Wook (pictured) and Choi Seung Il. The Malaysians won the 1st game 21-17 but the Koreans played better and faster and won the 2nd 21-8. 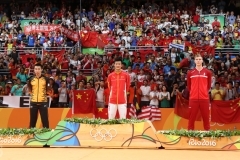 However, the Malaysian pair was able to forget about the 2nd game and focus fully on the decider, which they won 21-16. 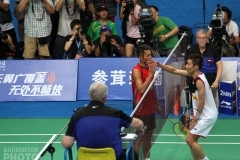 They will face Pratama Angga / Sugiarto Yohanes Rendy in the finals. The Indonesians took care of Thailand’s Phuangphuapet Nipitphon / D.Caballes Tin in the day’s shortest match. Meanwhile, there was an upset in the mixed doubles when top seeds Jongjit Maneepong / Chuthabunditkul Rodjana from Thailand were beaten by China’s Liu Peixuan / Xia Huan, 18-21 13-21. Liu Peixuan/Xia Huan will face compatriots Lu Kai/Bao Yixin in the finals, after Lu/Bao eliminated the last of India’s strong challenge at this tournament, beating Chopra Pranav / Sawant Prajakta 21-12, 21-15. The girls’ singles event, which saw some upsets, including the defeat of Thailand’s Porntip Buranaprasertsuk in the early rounds, will have Chinese Taipei’s Tai Tsu Ying and China’s Chen Xiaojia in the finals. Tai Tsu Ying played aggresively and impressively to beat 5th seed Febby Angguni. Tai lost the 1st game by a narrow 19-21 but made a strong comeback, racing out to a 8-3 lead and then scoring 8 consecutive points to take a commanding 18-6 lead in the 2nd set. She even forced Angguni Febby to dive and do the splits a few times to save the shuttles before the Taiwan shuttler eventually won 21-8. In the deciding game, it was a tight competition and a more determined Tai won it 27-25. 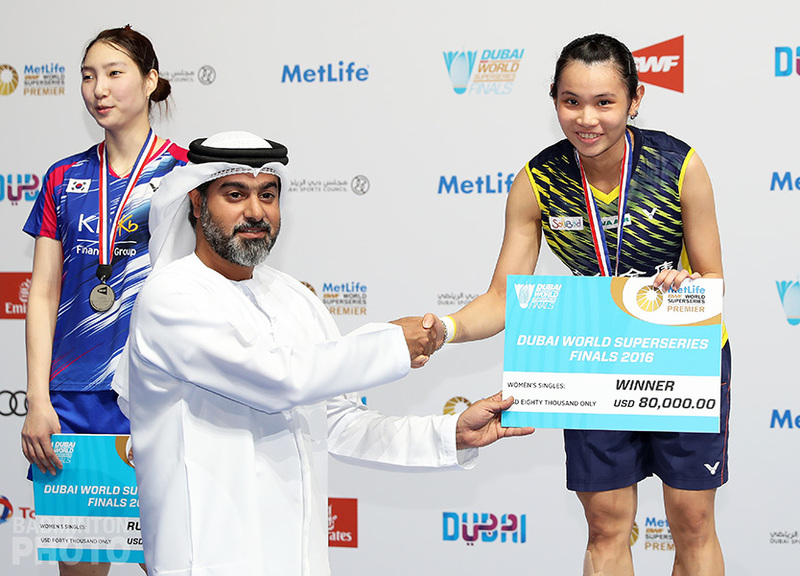 China’s Chen, who was troubled several times in the team competition, had her first real test in the individual draw from Indonesia’s Ana Rovita before finally winning 24-22, 21-17. The semi-finals ended with girls’ doubles, where China is assured of the title as they will have 2 representatives in the finals. 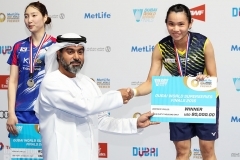 Xia Huan earned herself a shot at two titles on Sunday as she and Tang Jinhua beat Malaysia’s Ng Hui Ern / Lai Pei Jing 23-15, 21-15, 21-15. However, the Malaysian pair can stand tall as they gave a good fight which saw also saw them diving for the shuttles. The Malaysian pair also upset the top seeds, Nguyen Thi Sen / Vu Thi Trang, en route to the semi-finals in addition to playing well to help Malaysia in the team event. Meanwhile, Thailand’s Rodjana Chuthabunditkul (pictured) tasted disappointment twice in one day as she and Sapsiree Taerattanachai fell to China’s Luo/Luo. The finals will start with mixed doubles and end with men’s singles and surely Malaysia will hope to make it a double victory.